Selecting a graphics processing unit (GPU) (aka video card) that has exactly the right feature set for your home theater PC (HTPC) can be a time consuming task if you’re starting your search from scratch. In the ever-changing landscape of home theater and HTPC, AMD, Intel and NVIDIA respond by implementing new features in their GPUs to keep up with the latest and greatest audio and video innovations. 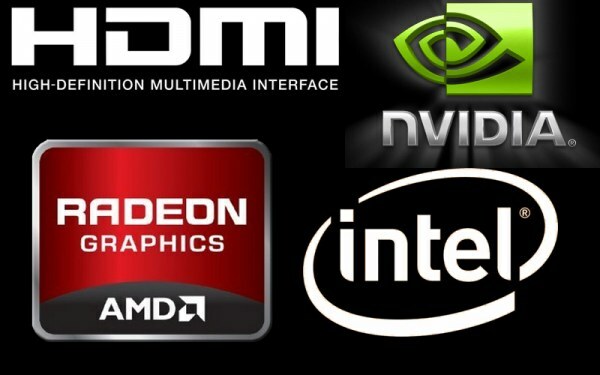 That is why we’ve got you covered here at MissingRemote with our brand new GPU comparison guide. We plan to keep the guide updated regularly and add new information as it becomes available. If you’ve got some ideas for items you would like to see compared in the chart, please feel free to let us know in the comments below. We’ve tried to sift through all the vendor specifications and parse out the vital information that you need to know. While trade names such as AMD’s Unified Video Decoder (UVD), NVIDIA’s PureVideo HD and Intel’s Clear Video HD are interesting, ultimately, it’s all about the feature set and that’s what you will see in the video card comparison chart. We’re starting out with what we’ll call today’s “modern” desktop GPUs though we plan to add some of the older GPUs for comparison sake since many are still running strong. MVC: Multi-view Video Coding is an addition to H.264 which is used for 3D Blu-ray encodings. H.264: AKA Advanced Video Coding (AVC). Common video codec used in video delivery in everything from streaming in Flash and Silverlight to Blu-ray. VC-1: Video codec commonly used in Blu-ray, HD-DVD, WMV, Silverlight and Slingbox. MPEG-4 Part 2: DivX and Xvid are common implementations of this codec which has been widely used for sharing video over peer-to-peer networks. MPEG-2: One of the most widely used codecs for video and still used today for ATSC broadcast and cable transmission. Found on some Blu-ray discs, but generally, BD discs now favor H.264 and VC-1. Flash: Adobe’s commonly used web multimedia platform. 3D Blu-ray (Frame-sequential): This refers to the GPU’s ability to deliver frame-sequential 3D Blu-ray content over HDMI. Originally specified in HDMI 1.4. Advanced De-interlacing: Techniques considered “advanced” are AMD’s Vector Adaptive de-interlacing, Intel’s Pixel Adaptive de-interlacing and NVIDIA’s Spatial-Temporal de-interlacing. In some of the lower-end AMD and NVIDIA products, advanced de-interlacing is not achievable with HD video. LPCM: Linear PCM audio. 8 channel’s of PCM audio can be accommodated within HDMI. When using LPCM, audio is decoded on the PC and then sent as uncompressed PCM over HDMI. HD Audio: Audio codecs such as Dolby TrueHD and DTS Master Audio are considered HD Audio. HD Audio is sent as the original bitstream over HDMI to a decoding device such as an Audio Video Receiver (AVR). TDP: Thermal Design Power. Unfortunately, manufacturers deviate with how they define this figure. It should be used to roughly gauge heat that needs to be dissipated from the part. When comparing with the same manufacturer, it can be used to determine whether a part will use more or less power under full load. Part reviews should be used for further guidance regarding real world consumption. And please, let us know what you think about the embedded spreadsheet versus a static HTML table! I think the spreadsheet is great. It just makes me sad that I can’t put a new system together. Is it possible to allow us to add this to our google docs without editing it? If it’s possible to lock the top 2 rows and have it so only the cards scroll, that would be awesome. It’d make it easier to look at features without scrolling up and down to figure out which column is which. We actually have that enabled in the Google Spreadsheet already but when embedding it in an iframe it is lost. We’ll see what we can do! I understand why you used the current color scheme, but a feature to allow you to change to a color scheme where all the Yes boxes were one color and all the No boxes were another would be useful. The background color scheme remains the same, but the text color for “Yes” is now blue and “No” is red. Would it be a fair assumption (based on the limited info leaked so far atleast) that the IGP on Llano would fall between the 6310 and 6570? Hoping you would be updating this chart once the official Llano specs are available? Yes, when Llano comes out, we’ll be adding it. There is some preliminary info out there, but we didn’t add it yet because we don’t want to place incorrect information in the table. What about including current AMD IGPs? Radeon HD 4200, 4250, etc. Thanks for all the great feedback. Keep it coming. We’ll see if we can implement some of these ideas. One thing to note with the 5450 and 6450 is that they are too weak to decode video will all of AMD’s post-processing features, especially if “Enforce Smooth Video Playback” is enabled, preventing you from adding so many features that you start dropping frames. As such, the Radeon HD 6570 is probably as low as you can go and get just about everything possible in a card. This is designated as “Advanced Deinterlacing” in the chart. Can you please provide a link specifically regarding the 6450 as there may be some conflicting information about this? Updated. Now contains a legend. My 4650 is bitstreaming HD audio without issue using ffdshow. You mean LPCM, right? Decoded HD Audio. I don’t pretend to be an expert on this audio stuff, but my receiver shows DTS-MA or TrueHD on its display when I play my MKVs, which I’ve put HD audio into and ffdshow shows “bitstreaming” during playback. I guess you’re lucky. It’s not a feature that came to AMD until 5xxx series. Can you bitstream a normal BD with TMT or PDVD? Any chance updating this with the ATI 6250 – seen it few laptops. Great article. However, a key peice of information is missing. I use LINUX for mythtv and XBMC and know that historically, those environments will not work for me with any ATI card. The ATI drivers for Linux just don’t implement the accelleration features needed to play 1080p video. Could you update this and include this?